The idea for my book "Future Arctic: Field Notes from the Edge of the World" got its start in 2006 when I spent some time with scientist Ian Stirling catching and tagging polar bears in the Beaufort Sea. The pilot of the helicopter I was flying in on the way home, told me a rumor that an American hunter had shot a strange-looking bear on the sea ice just a week earlier. The bear apparently had the features of both a grizzly bear and a polar bear. As convincingly as the pilot told the story, I still filed it away with the many tall tales I had heard from various people during my travels to the Arctic. I soon regretted that I did. The dead animal turned out to be a cross between a female polar bear and a male grizzly bear - the first wild hybrid of its kind (photo above). Since then, I have taken 22 trips to the Arctic by foot, canoe, snowmobile, icebreaker, helicopter and bush plane with scientists, archaeologists, Inuit hunters, oil and gas developers and with the Canadian team that was mapping the ocean floor near the North Pole. During that time, it became clear to me that the Arctic as we once knew it is coming to an end. 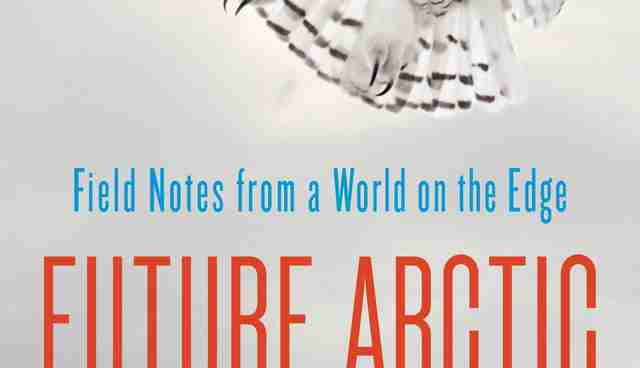 What the new Arctic will look like is the subject of my book. Below is one of those stories. In the late summer of 2011 when I was hiking along the north coast of Banks Island in the High Arctic with scientist John England, we came upon the freshly excavated den of a bear. Assuming that it was one of a number of polar bears known to den in this part of the Arctic, we circled back to make sure that we weren't being stalked. Although we saw no sign of the bear anywhere on the treeless tundra, we did find the fresh tracks of the animal that had been doing the digging. The tracks, however, were not those of a polar bear. They were clearly those of a grizzly bear, presumably one that England had seen a few weeks earlier while flying over a tiny, treeless island off the northwest coast of Banks. 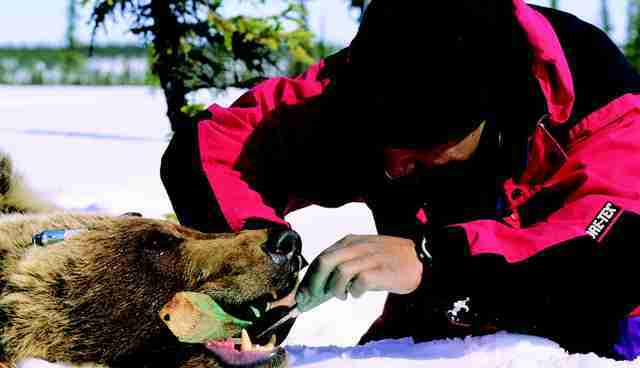 What this brown bear was doing along the northernmost edges of the kingdom of its white cousin is not entirely clear. Considering the time of year and the amount of effort the animal had expended digging this big hole into the frozen hillside, though, it was obvious that it had no intention of walking back to where it had come from on the mainland 300 miles to the south. While barren-ground grizzlies are common in the western Arctic, until about 20 years ago, sightings in the Arctic Archipelago were extremely rare. This quirk of nature, many biologists thought, may have simply occurred because the bear ended up walking the wrong way or strayed too far following caribou. That thinking, however, has begun to change in recent years. The migration of southern animals into the Arctic is an intriguing development that may result in an addition or subtraction of several pieces to the puzzle that will determine what the Arctic will look like in 50 to 100 years. The new dynamics will include the possibility of displacement of Arctic native species, with fish and animals like Pacific salmon and red fox potentially outcompeting Arctic char and Arctic fox for food and territory. And with sea ice no longer stopping them, killer whales could drive beluga whales and narwhals out of the biological hotspots they depend on in summer. 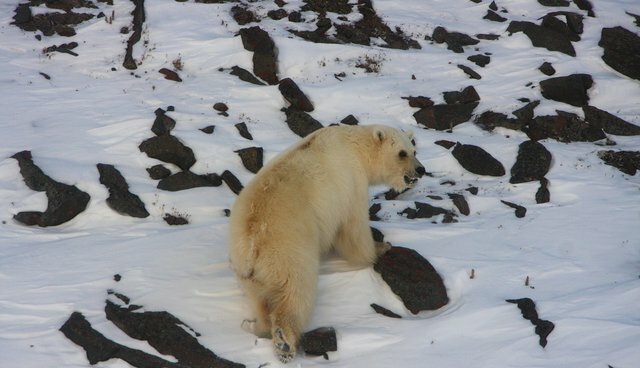 Additional effects could come from diseases carried by southern animals from which some Arctic animals have no immunity. There is also the potential for a variety of closely related animals - such as grizzlies and polar bears - to interbreed and produce hybrids that could drive some native species to extinction. It's impossible to predict how each of these influences will shape the species that survive in the future Arctic and which ones will not, but we are already seeing evidence of change in a variety of ways. I first heard of animals interbreeding in the Arctic in the spring of 2006. I was flying in a small plane from Tuktoyaktuk to Inuvik in the western Arctic. I had just spent a few days with scientist Ian Stirling, who was catching and tagging polar bears in the Beaufort Sea. After learning what I had been up to, the pilot told me that an American hunter had shot a strange-looking bear on the sea ice just west of Banks Island a week earlier. The bear apparently had the features of both a grizzly bear and a polar bear. The wildlife officer who investigated was so confused that he seized the dead animal until the origins of its parentage could be proved. 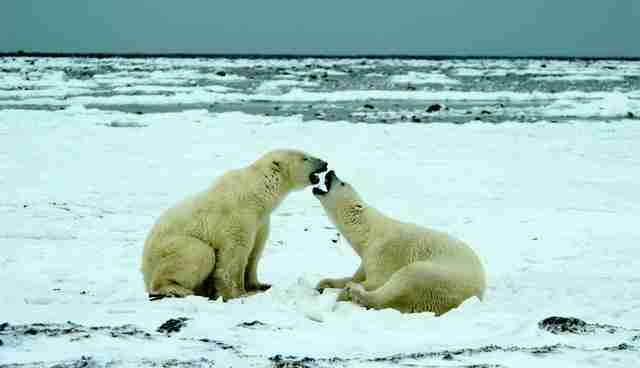 Grizzly bears and polar bears have produced hybrids in zoos, but the biology and behavior of the two animals suggested that they would likely make war, not love, in the rare event they met on the sea ice. In Inuvik, I didn't bother to drop in at the government wildlife office to see if there was truth to anything the pilot had told me. I soon regretted that I hadn't. Back home a few days later, I learned from polar bear biologist Andrew Derocher that an American hunter had shot a polar bear/grizzly cross that spring (photo above). As it was a first in the modern wild, no one was willing to suggest that this hybrid might signal a trend. It did, however, get Alaska biologist Brendan Kelly wondering whether this kind of hybridization was occurring in other Arctic species. Kelly was well aware that seals, walruses, and sea lions are more prone to hybridization because they share the same number of chromosomes, which allows them to produce offspring. He also knew that the zones in which hybridization are likely to occur have been limited by sea ice that effectively prevents Atlantic walruses and narwhals, for example, from moving into the Pacific and prevents Pacific salmon and other marine animals from moving into the eastern Arctic. If you removed continent-sized ice sheets that prevented southern marine mammals from moving north into the Bering and Chukchi Seas and from the Bering and the Chukchi into the Arctic Archipelago, he wondered, what might be the outcome? The question was not an outlandish one because Arctic sea ice receded to a record low in 2007. Kelly collaborated with biologists David Tallmon of the University of Alaska and Andrew Whiteley of the University of Massachusetts Amherst to review the scientific literature on hybridization. They learned that hybridization had already occurred between harp and hooded seals, narwhals and beluga whales, and very likely between North Pacific right whales and bowhead whales. Looking at further potential for hybridization, they concluded that at least 22 Arctic marine mammals are at risk and that many of these species- 14 in all - are threatened or endangered. Hybridization - the crossbreeding that takes place between two species - is more common than most scientists once thought. The frequency of interbreeding species is 25 percent in British ducks, 10 percent in birds, 6 percent in European mammals, and 12 percent in European butterflies. In the wonderfully documented case of Darwin's finches in the Galapagos, Princeton University's Rosemary Grant and Peter Grant found that hybridization occurs rarely - in less than 2 percent of breeding pairs - but persistently from year to year. Interbreeding between two distinct species can be both good and bad for biodiversity. It can be good because it can lead to the evolution of new and more robust species such as the polar bear that is the product of interbreeding between prehistoric polar bears and female brown bears that crossed paths in Ireland during the Ice Age. It can be bad, however, because it can result in hybrids that are less productive or infertile, or genetically unequipped to tolerate disease and rapid environmental changes, than the original species. Like his co-researcher Brendan Kelly, David Tallmon, a biologist at the University of Alaska, believes that there are other things to consider, such as interbreeding that may have social implications. The beluga/narwhal cross that was discovered in Greenland several years ago, for example, lacked the tusk of the narwhal that is so important in breeding success. In zoos, grizzly bear/polar bear crosses exhibit the seal-hunting behavior of a polar bear but not the animal's strong swimming skills. "There is something to be said about species adapting to climate change," Kelly told me, four years after he and his colleagues made their controversial views on hybridization known in the journal Nature. "But the kind of adaptation that's necessary is a shift to genes that fit the new climatic environment better than the old genes. That takes time. The change that is taking place in the Arctic now is happening so fast that long-lived animals like whales, seals, and polar bears aren't getting the chance to adapt as quickly as it is necessary." All three scientists still believe that the International Union for the Conservation of Nature should develop a comprehensive policy for managing hybrids, including determining when it is practical to prevent or limit hybridizations. Admittedly, hybridization is likely to be a slow process compared with other threats from climate change, but it throws an interesting wrinkle into the question of what species will survive and how, as well as what contributions new species might make to the ecosystem dynamics of the future Arctic. It turns out that the polar/grizzly hybrid killed in 2006 was not, as some scientists initially thought, an anomaly. A year before my arrival on Banks Island in 2011, an Inuit hunter had shot another hybrid off the coast of Victoria Island. The following year, biologists Jodie Pongracz and Evan Richardson documented an unprecedented cluster of hybrids and grizzly bears in Viscount Melville Sound northeast of Banks Island where polar bear numbers are sparse and where a grizzly has only been seen once. 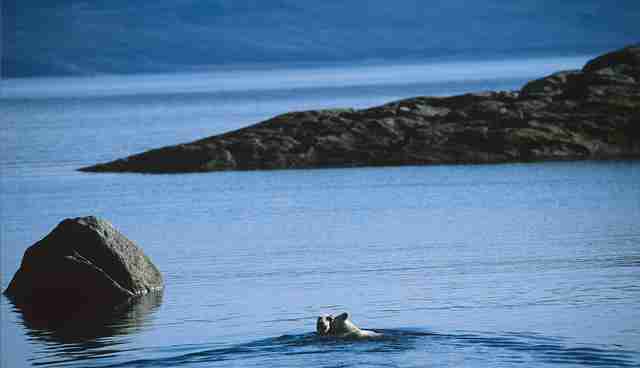 These sightings of three grizzly and two hybrid bears in close proximity to one another so far north was unprecedented. It could, however, herald even greater changes to come.